This lesson originally appeared as a blog post by Georgia Hutchings. Ever thought that your LiveCode project could be improved by a custom control? Perhaps you want to add a rounded rectangle push button to your stack, where the border color is different to the text color? Maybe you’re thinking of building an app with 10 cards, and each card needs a header bar, and each header bar needs a label, a button, a background graphic, a line graphic… Getting tired just thinking about it? Enter widgets. Widgets are controls that can be dragged from the tools palette and dropped onto your stack. In LiveCode 8, users now have the ability to write their own custom controls, or widgets, in the new LiveCode Builder language. The purpose of this article is to guide you through the widget writing process in LiveCode Builder, from the very start to using your end product in a LiveCode stack. The widget we will be writing is the speech bubble, as featured in the first app on the CreateIt with LiveCode course (check out this video for more information on the course). Disclaimer: The following is intended towards the more advanced user, although all are welcome to try writing widgets, and have a go using LiveCode Builder in general! 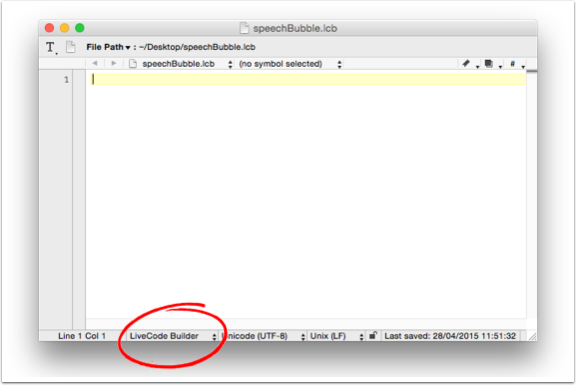 Next, create a folder “speechBubble” in which to save the .lcb file. When you build and package extensions, additional files that are associated with the extension are created. By saving the .lcb file in a folder, all additional files that are created will be saved in the same folder. Open TextWrangler, select the LiveCode Builder color scheme and save the file as “speechBubble.lcb” in the “speechBubble” folder. Now we can begin writing the widget! The first thing we need to do is declare the type of extension we are writing. There are two types of extension in LiveCode Builder: widgets and libraries. Widgets are controls and libraries add new commands and functions to the engine. We are writing a widget and so we need to declare the extension as such. where the username should be the username you use to log into the LiveCode extension store. Don’t have a username? Create one here. In this widget, we have two dependencies: the com.livecode.canvas library, which specifies the syntax definitions and bindings for canvas drawing and operations in LiveCode Builder, and the com.livecode.widget library, which consists of the operations on widgets provided by LiveCode Builder. 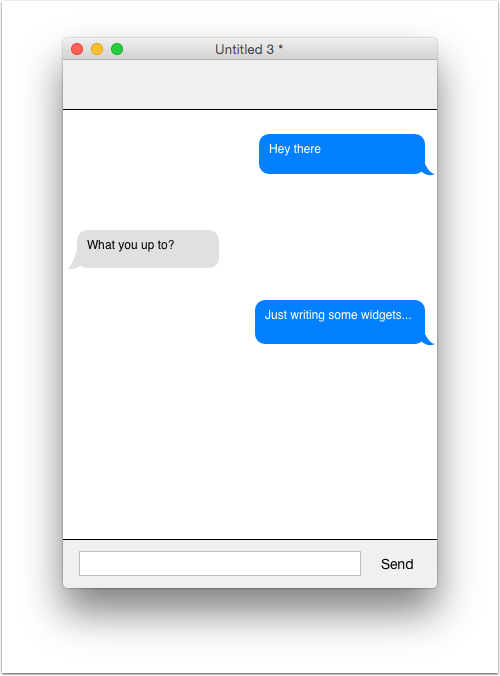 This widget has two properties: the text that will be displayed in the speech bubble and the color of the speech bubble. For these two properties, we only need to declare “set” handlers. The properties’ values will be stored in private instance variables, which we will need to declare later. In order to Package any extension in LiveCode Builder we need to add metadata which is required by the LiveCode store: the extension’s title, the author and a version number. If the required metadata is not added, then a number of warnings may be printed into the log field when building and packaging the extension. metadata title is "Speech Bubble"
metadata author is "Georgia Hutchings"
We also need to add some metadata for the properties declared above. For each property we need to set: the editor for the property in the property inspector of the widget; the default value that is displayed in the editor if the property has not been set yet. For the property bubbleText, we want the property editor to be a string editor and the default value to be “Hello World”. For the property bubbleColor, we want to restrict the user to two options: blue and grey. To do this, we need to set the property editor to an enum editor. We also need to set the options available, as well as the default value. metadata bubbleText.default	is "Hello World"
Finally, we need to declare any private instance variables and constants that we are going to use. We have four variables in this widget: two that store the property values and two that store paints. There is also one constant that will be used when drawing the widget. Now that we have taken care of declarations, we can get on with writing the handlers! We want to be able to save and load the widget’s properties. If the following handlers are not included then every time you open a saved stack that includes a widget, the widget will lose it’s property data and the properties will be set to the default values. Next we will take care of the handler that set the widget’s properties. In the property declarations, we defined “set” handlers for each of the properties. These are called when the user sets a property in the property inspector. We will define the “set” handlers below. The set handlers are private to the widget and don’t return anything. For this widget, both set handlers take a string as a parameter (the string entered by the user into the property editor in the property inspector). First we want to be able to set the bubbleText property. This handler is very straightforward as all we need to do is set the mText variable to the string entered by the user. Next we want to set the bubbleColor property. The background color and text color depend on this property, so we will also set the paint variables that we declared in step two when the bubbleColor property is changed. The reason for doing this is so we can speed up the drawing process, by taking as much calculation out of it as possible. Next we write the OnCreate() handler. This is called when the widget is first created, and here is where we initialise the private instance variables that we declared in step two. We will set the variables that store the property values to the default values. We will use the setBubbleColor() handler to set the mBubbleColor, mBackgroundPaint and mTextPaint variables in one. The OnPaint() handler is called whenever LiveCode needs to redraw the widget, and it is here that we write the code that draws the widget. First, we draw the speech bubble. The speech bubble is made up of two shapes: a rounded rectangle that forms the main body of the bubble and a crescent shape in the bottom corner. We start by setting the paint of the canvas, then we fill the paths of the two shapes. Next we draw the text. We need to change the paint of the canvas and set the font, then we can draw the text within a text box. You will notice that the paint, the paths and the text box are all set from custom handlers. We will write these handlers in the next step. The fetchPaint() handler is private, it takes a string as a parameter and it returns a paint. Since the paints are stored in variables, all we need to do in this handler is return the correct variable based on the object. The fetchPath() handler is private, takes a string as a parameter and returns a Path. This handler draws the path for the main body of the speech bubble, a rounded rectangle, and a crescent shape that forms the flick at the bottom. Typically, the blue speech bubble looks as though the speaker is to the right of the screen and vice versa for the grey speech bubble. We use the buffer constant as we do not want the rounded rectangle path to go all the way to the edge of the widget’s bounds on all sides. This is so that we have space for the crescent in either the bottom right (blue speech bubble) or bottom left (grey speech bubble) in the bounds of the widgets. In order to draw the crescent shape we need to draw two curved lines. We do this by first creating a new empty path, then move to a point to begin a new subpath. Next we continue the path with a curve through a specified point to another specified point. Finally, we curve through another specified point to end up at the start point. The fetchTextBox() handler is private, takes no parameters and returns a Rectangle. Again, the position of the text box depends on the color of the speech bubble. We want the text box to fit nicely inside the main body of the speech bubble, with a ten pixel buffer between the edges of the text box and the edge of the rounded rectangle part of the speech bubble. That’s it for the code! So let’s test, package and install the widget. 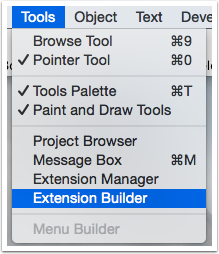 Open LiveCode 8 (download for latest release is available here), and open the Extension Builder from the Tools Menu. You will then need to select the folder icon in the top right hand corner and choose your speechBubble.lcb file. You should be able to see five buttons on the bottom right hand side of the plugin: Package; Uninstall; Install; Script and Test. First we want to hit Test. This will compile and load the widget, and a new stack should pop up containing the widget. Any compile errors will be displayed in the log field in the plugin. Providing the widget has compiled successfully we can Package and Install the widget. To package the widget, you will need to have an icon. Pressing the Package button will ask you to select an icon, and once the icon has been selected an extension package will be produced. You will find this in the “speechBubble” folder. 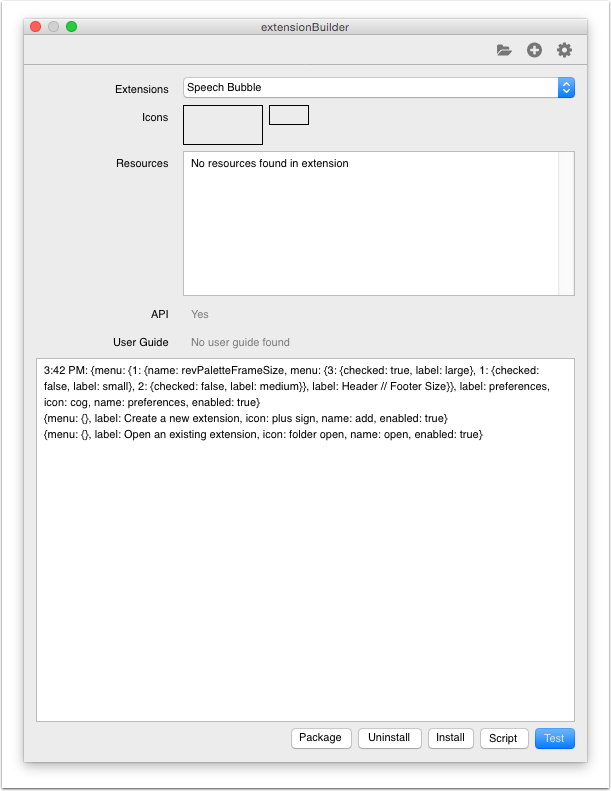 The file name will be the widget identifier that you set in step two after declaring the extension as widget, and the file extension will be .lci. Finally, pressing Install will install the widget in the “Extensions” directory of your “My LiveCode” folder. It will now be available to you whenever you run the LiveCode IDE. Prev: How Do I Upload an Extension to the Extension Store? Hi Sphere, there was an error in the example code. I have updated the lesson and included the final .lcb file as an attachment you can compare to.